Cadillac resident Eugenie White Westhauser claps for former coaches Sunday during the Women’s Athletics Varsity Letter Celebration at Kellogg Center. 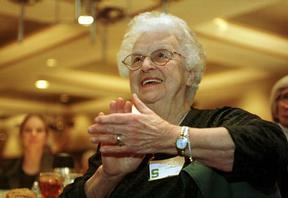 Westhauser played field hockey for MSU in 1932, and is the oldest woman athlete being recognized. “I’m in awe and very excited,” Westhauser said about her varsity recognition. 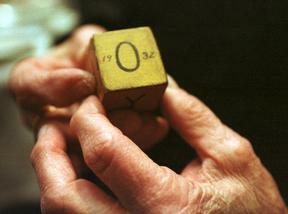 Eugenie White Westhauser, a 1932 field hockey athlete, holds her field hockey block, which she received in 1932. The block was the older version of the varsity letter and has the letters of the word “hockey” on its sides, along with the year and her name. In a ceremony in February, the university presented letters to 200 women who played sports for Michigan State before 1980, when the university began complying with a new gender-equity law by, among other things, awarding varsity letters to its female athletes. "Women's sports have certainly come a long way since my days in the '30s, when we traveled by train for our games, playing in the pasture, and wearing our baggy bloomers and long-sleeve blouses," says Eugenie Westhauser, an 88-year-old retired teacher. 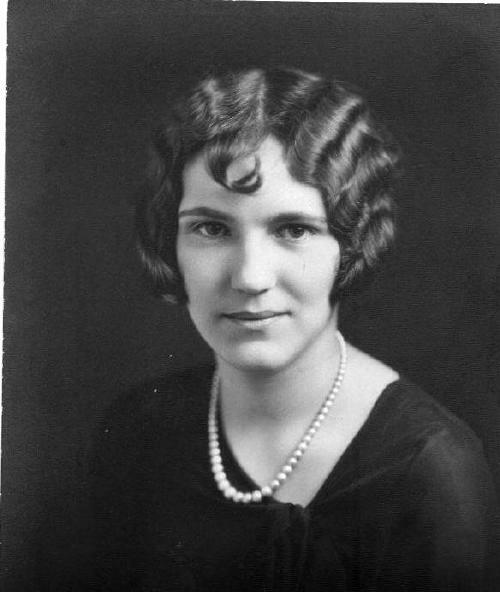 She played field hockey in 1932.